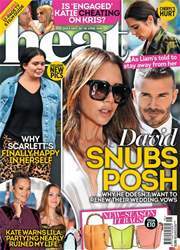 In this week's heat: Is Joey Essex about to propose to Sam Faiers after just seven weeks? Jen Aniston sets Gwyneth up with Orlando (we know, right!) And – just in time for her 40th birthday – we have the proof that Victoria Beckham smiles quite a lot.